When Marines go into the night, they need a no compromise knife that can get the job done. This 12 in. 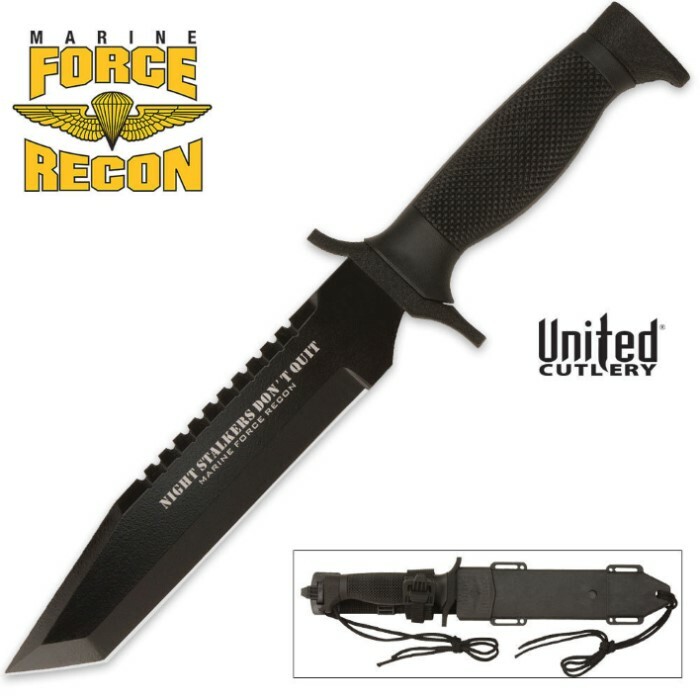 Night Stalkers Combat Tanto is the answer. It sports a 7 in. 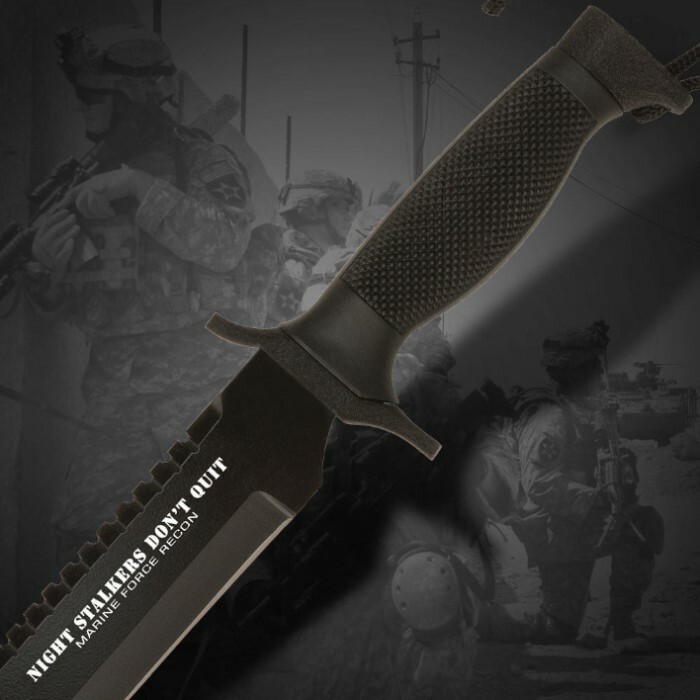 black finished AUS-6 stainless steel blade with back serrations, hand guard, and "Night Stalkers Don't Quit" artwork. The black rubberized handle provides a no-slip grip and features a lanyard. The whole package fits snugly in the included nylon and ABS sheath. At a great price. Holds an edge well, good weight and balance. Sheath is heavy duty and ties down giving freedom of movement without the knife slipping about. Decent sized blade gives this knife good heft. Very pleased with this purchase. I bought this after I bought the one shot one kill survival bowie because it was similar to that and this knife is really great! Although I boutght it when it was $20 and it's a bit loose in its sheath it looks really cool and has a good weight and feel to it. Also it came with a fair edge on it and with just a little sharpening I was able to get it razor sharp. Also the serrations on top of the knife are pretty much useless but it's stil an awesome knife! Great knife for the price. i bought this one for the tanto blade. I have similar with a curved blade. This came sharp, has a good solid feel, the grip and pommel feel good in your hand, and it has some nice weight. I always carry this in the woods when hiking, and would recommend it to a friend. The sheath is rugged, yet flexible, so if it's tied to your leg, you can crouch down and the knife moves with you. Great purchase. I bought this on a $10 sale. Great knife for the price. Came dull but I was able to put a decent edge in it in no time. I will be buying a couple more for gifts. i just purchased (2) of these knives recently! I was really surprised how great they are! Love the grip and the balance and feel of these knives! Fast delivery and i have always received great service from BUDK! I would highly recommend these awesome knives to anyone who is looking for a nice little addition to their collection! Makes a great gift for you friends! A customer for life! Love the sheath, love the knife good value very nice overall. This is a good knife for the money, hard working and tough. I made this purchase for my brother who loved the one I used to have. My original was advertised on a different site (rhymes with ButtK), as a Full Tang. When I got it, I removed the hex nut on the pommel and discovered it was a rat-tail tang. I'll never buy from them again. This piece is worth the minimal cost all day long. Knife is good but not recommended for tough work or when you need a dependable knife. Has decent edge when received. Good knife, for $20 you really can't go wrong. If looking for a more high quality knife check out the carbon or Damascus steels. Love the knife, came dull as a spoon. And the sheath doesn't fit snugly. But the sheath is gorgeous, and sturdy. Other than the dullness and sheath not fitting snugly, I've got no complaints. Wonderful knife, and great buy. This knife is amazing! I love tanto blades and the grip is great! Great product from budk!